Tomorrow Seasonal Eating will be 6 months old! I’ve decided to simplify my format by writing one post per week with both my veggie list and menus, instead of a post for each. Fall will arrive this week, with a whole new season of autumn veggies! Meanwhile, our late summer tomatoes are coming in by the bushel, and I planned to make and freeze some tomato sauce. I skipped the U-Pick at Live Earth Farm (our CSA) yesterday, thinking that instead of driving to the farm I’d pick up about 5 lbs. at their local farmers market stand. It was the end of the market. After chatting a bit about our farm, the vendor offered me all the remaining dry farmed Early Girls for $10. I debated because there were so many, then my thrifty Yankee roots prevailed, and I agreed. 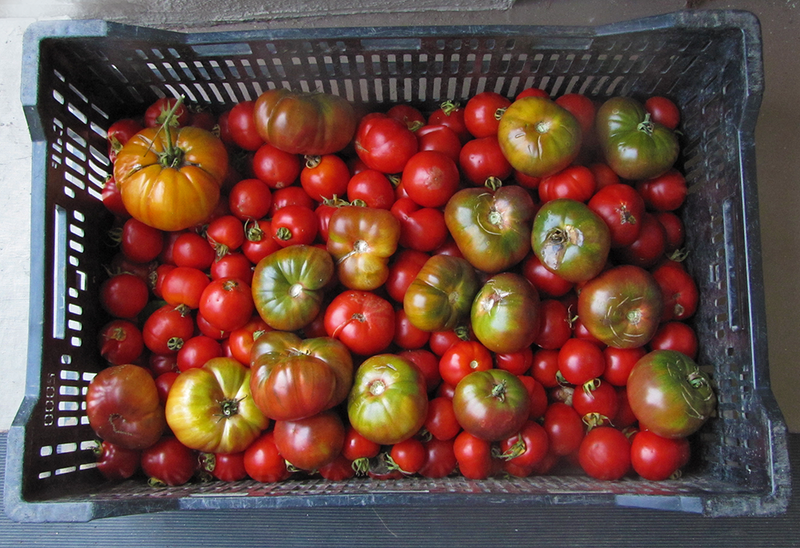 Then she said to take all of the heirloom tomatoes too! A total of almost 35 lbs.! After taking all that I wanted for sauce and a quick snack, I foisted as many as possible on a contractor who’s doing some work for us. “I’m a meat and tater man,” he said, but agreed to take some "maters" for his girlfriend and his business partner. Then I called my longtime friend Joe, a local mountain man who recently distributed 15 cauliflowers to his neighbors, a considerably harder-sell than tomatoes. He was amazed at the quantity left after both Greg and I had taken what we wanted, but hefted the box to his shoulder, saying that some of his neighbors were dirt-poor and would greatly appreciate fresh produce. Let there be veggies!